As a mom, you have “your little helper” – you know that adorable kid that “helps” you in the kitchen, especially during Christmas baking. She’s the one that accidently stirs half of the flour right out of the bowl or drops two eggs on the floor while she’s trying to “do it herself.” You know that helper. The one you take pictures of every year as she “helps” you make the Christmas treats. The pictures looks great in the scrapbook – much better than the kitchen counters did after the treats were done. Something happened to “my little helper” this year. There was some sort of transformation. She actually became a HELPER! It makes me tear up a little. 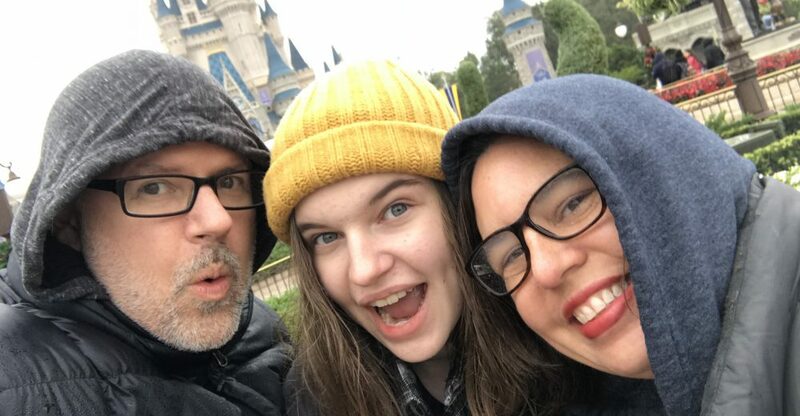 My sweet little pumpkin has become a fun loving young lady who is now old enough to be truly, well there’s no other word for it, a helper. I can honestly say that she took about an hour off my baking time Tuesday. Seriously, an hour. 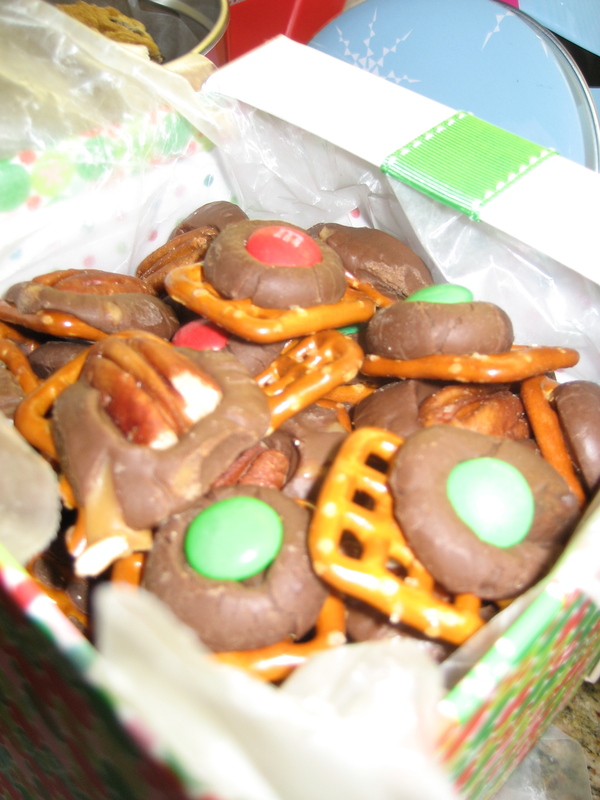 We made Holiday Pretzel Treats together. You can find the actual recipe here. We made an additional variation with Rolos and pecan halves. 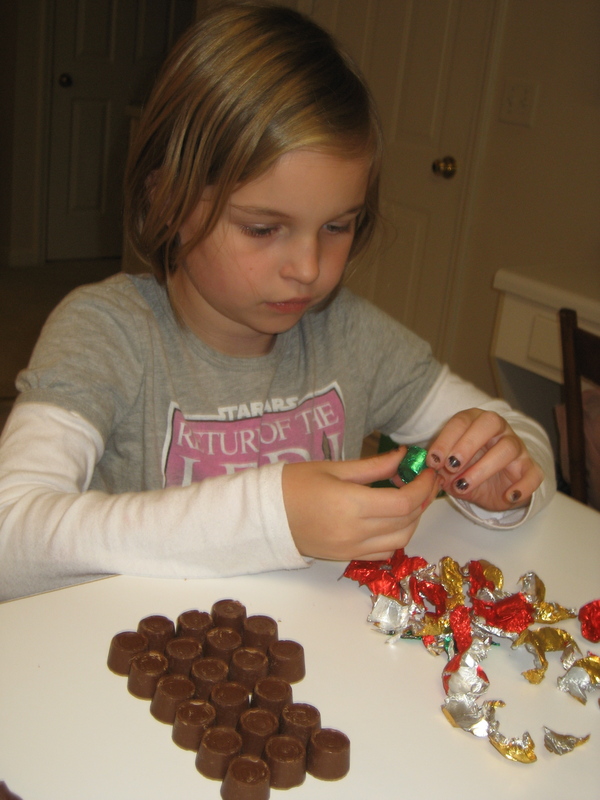 Maggie did the hardest part which was unwrapping all the Hershey Kisses and the Rolos. She was great!!! She even lined them all up so they were easy to count and know how many we had. This is the part that saved me the most time. Then Mags placed the pretzels on the pan (notice it’s lined with parchment paper for easy clean up). She did most of this herself too. I just came behind her and fit a few more on the tray. 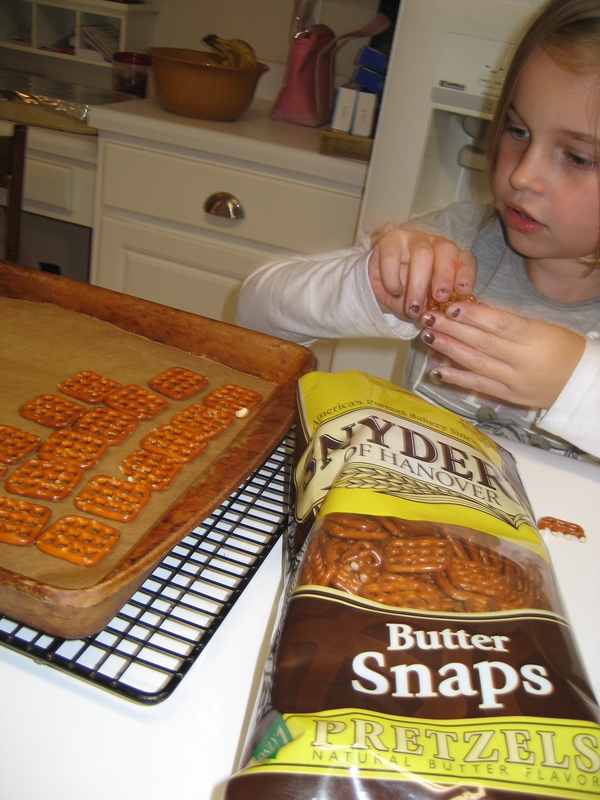 I like to use the butter snap pretzels because they add a little something to it. A plain pretzel is good too, but I prefer the butter snaps. Of course, they’re more expensive. 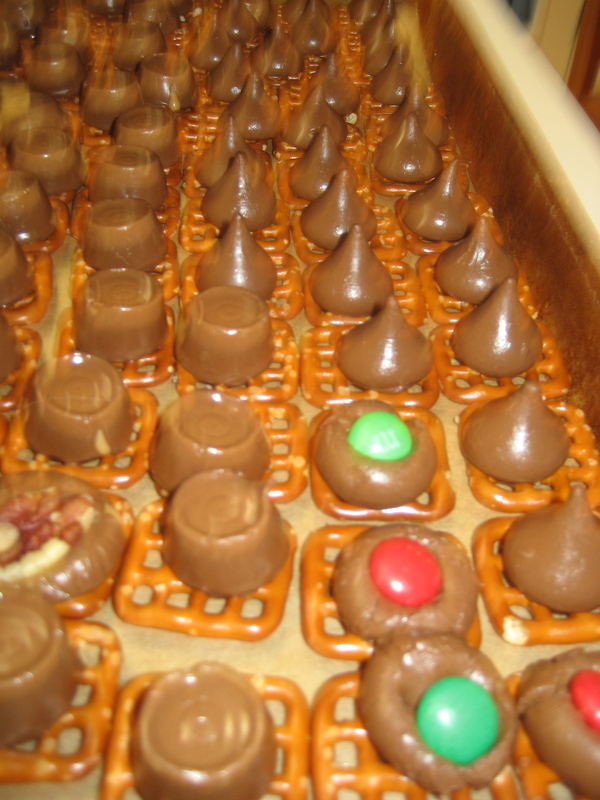 The last step before the oven was placing a Rolo or Hershey Kiss on each pretzel. Another time consuming task where Maggie was a huge help. She was getting a little tired by this point so I made it a race to see which one of us could do a row the fastest. We were done in no time. Then they went into a 250 oven for about five minutes – just enough to get the candies melted. The final part has to be done QUICK!! Place an M&M on the Hershey Kiss and push down. Place a pecan half on the Rolo and push down. We had Maggie get on a stool for this part so she wouldn’t burn her hand on the pan by leaning on it. We also called in Daddy to help us get the M&Ms on fast enough. The Hershey Kisses don’t stay melty as long as the Rolos. Finally, we put the tray in the fridge and let them cool for awhile. The next morning I put them in a cute holiday box lined with waxed paper and took them to the office. They were a hit! While I’m glad my co-workers and friends enjoyed eating these little treats, it really was the making them that was special. I know I’ll remember that time forever. My little baby is growing up and becoming more and more independent. She’s becoming more a little person. And now I actually have a helper during the Great Christmas Bake! Oh! I almsot forgot! Maggie helped clean up too! She threw away all those little annoying wrappers and made sure to get every last one. Amazing!!! This entry was posted in Cooking, Maggie, Recipe by KHill. Bookmark the permalink.